I know that life can be difficult at times with so many things flying around our heads. Sometimes you have so many problems to deal with you feel like you are going to explode. Past regrets, present problems and future fears all come at us at once. Self pity is like a little monster hiding under the couch waiting to destroy us. But guess what? You don’t have it worse than everyone else. If you are reading this then you are not blind, right? I know a man who lives in Colombia who is homeless, has no arms AND no legs, and all though he has a right to, he does not feel sorry for himself. Let me give you a magic formula to destroy the little monster under the couch. Forget about yourself. Yes, I did just say that and yes, it is possible. Care about someone else. The entire Gospel is summed up in the two greatest commandments. Love God. Love others. There are so many stories I could fill books and books but the following are just a few of the individuals I have met a long the way in recent years. Maybe some part of their story will touch you like it did me. And maybe soon you will have a name and a story that you could add of someone that you touched. time. We originally met him when one day we were setting up our equipment and doing sound checks. A crowd had gathered and we were about to start when my dad looked over and saw Guillermo sitting there playing his guitar, sad because he would now not be heard. We instantly stopped our music and brought him into our crowd, where he played for everyone and they all gave him money. What is most important in God’s eyes? This began a long beautiful relationship with a man that has changed me as much as I have changed him. Guillermo is 70 years old and blind. He plays the guitar and sings to make money. Pretty much everyone ignores him. When we would perform on the streets, Guillermo sang one or two songs in our crowd. In his mind he is not homeless but a great, old school singer like Andrea Brocelli. We call him the “Gentleman of Bogotá” and he is a beautiful man who has an infectious laugh. One day my brother and I took him “home”, home being a horrible, smelly, leaky tiny shake in the worst part of town. When I opened his door it was pitch black and I looked for a switch when Guillermo walked past me and began settling in. It hit me hard to realize that there is no light switch because the man that lives there cannot see light, only darkness. We were able to fix up his house a little. The traffic was hardly moving because it was raining hard in Venezuela. We sat at the same light as it changed from green to red three times. The streets were mostly empty, except for the homeless of course. My eyes fell to one man sitting on the ground next to a bench. He was a shoe shiner… who was shining his own shoes. They were already spotless glossy black, but had nowhere else to go and nothing else to do, so he sat in the rain and shined his own shoes, again, and again and again. He has a loud booming voice, a big smile and called me his angel. He was 70 something and had been in a horrible accident caused by a drunk driver. He lost his leg, suffered paralysis to his left side and lost much of his vision and hearing. He migrated to Argentina from Italy and used to work as a renown chef and baker but since loosing his leg he cannot work and now calls out to the passerby’s to help him. His name is Fernando. I gave him a T-shirt and he wore it every day since, (now there will always be a Fighting Irish fan on the other side of the world:)). As I crossed the street in Lima Peru, I heard a voice calling in Spanish, “Excuse my brothers, excuse me my sister, could you help?” then again “Hello my mother, oh you there, my father, could you spare anything” (in other cultures strangers can be addressed as mother, brother ecs). I walked back to see a blind man with a little puppy sitting on his lap. His name is, Feliz (happy) and his puppies name is Prince. He is blind, so he randomly guesses who might be walking by and calls out hoping someone will think he is talking directly to them and help him. The mass crowds however, walk by and completely ignore him. I will always remember Prince and Feliz. “No, thank you” he says, declining the scarf I was going to give him to keep him warm, “when the sun comes out I won’t be able to take it off”. His name is Juan, he lives in Colombia and he has no limbs. He sits in the middle of a busy side walk every day and begs, “standing” on his torso. He cannot get himself there on his own. He cannot eat or drink on his own. He cannot itch his nose or move out of the rain. He has to stay right where he is until someone comes for him. He sees everything from three feet off the ground as thousands walk by him. He has a heart, he has a soul and he has a mind and he always has a big warm smile and get this, he asks me how I am! “Yes, my birds were lovely…”, she tells me for the third time sitting in her wheelchair staring into the past.She is ninety eight years old, her sight is failing and she is cold all the time. She does not have any family and not a friend in the world. I asked her if I could get her anything. She said she would be so grateful for a cup of “tinto”, (which is coffee) because it had been so long since she tasted it and the “nursing home” where she lives cannot afford it. She has so much to say just no one who listens because no one has come to visit her in years. Her name is Luz Maria. “I didn’t even get to say goodbye to my kids” cried Veronica from inside an Argentinean prison. She made a stupid choice to run drugs when her money ran low and got caught. She has never used drugs and is a very pretty upper class woman. She has been in for five years and not yet received a sentence. There are so many children I have met that broke my heart. Like this one little girl that would not let go of my hand no matter where I went as I walked around the orphanage in a jungle town in Colombia. She outright begged me to be her mother and take her home. Other kids would try to fight to take my hand because in their minds that would “claim” me and I would choose them. She ran along side my window, crying as the UN jeep took us away. Another eight year old boy named Ricardo, with the fingers on his right hand disfigure d caused while chopping bamboo for his mother with a machete. He saw his father and brother murdered by drug lords and he has had to grow up and mature beyond his years. He does not smile often and when I made him laugh, I did not want the moment to end. by bullies that she could not even smile for a picture (most kids love having their picture taken). She did not talk much but just kind of walked by me, then as we were leaving she grabs my shirt and just says, “Don’t go teacher”. Ivan was always in the exact same spot sitting in his wheel chair. I would see him and talk to him almost every day when we stayed in Medellin, Colombia. I would take him meals; we took him to the doctor once and shared a lot with him. Then one day I walked by and he was not there. Didn’t think much of it until the next day when he was still not there, then I started asking around. A man who wad been his friend told me that he had died. He tried to get down the stairs from the metro by himself and fell. He was always there, now he was gone. Sebastian has downs syndrome, but does not let that stop him from trying his hardest to do every Tae Kwon Do move perfectly. He fills his shout with energy and keeps his gaze straight ahead. His parents are very poor and are glad they can send him to this free school Chile, everyday. He tells me that he thinks its important to hug all his fellow special needs students. I agree. “It was a plastic knife!” “I could have never hurt anyone” says Jon who is serving 20 inside a maximum security prison in Uruguay. He has so hungry he robbed a food store and now is here. He shares a cell with 7 men, suffers freezing cold temperatures, barely enough food to feed a man of his size, violent gangs, abusive guards and no hope of escape. This picture was so sad it will always stay in my head. As we drove to Chile, I saw this very old woman sit next to a busy highway with her arm outstretched. Trucks were flying by so close to her that the wind almost topples her frail body. There are no houses in sight and no other people around. I don’t know where she came from or if she has a place to go. There is no shoulder on the road, she might be hit and killed but somehow I don’t think she really cares. She is desperate; maybe someone will toss her something to keep her alive for just one more day. Her name is, well it’s not that I don’t remember her name, it’s that she does not remember because no one has spoken it in so long. He is a prisoner but he does not know it because his mind is almost gone. He followed me all the way out as we left the prison in Sao Paulo Brazil, singing a song that he had written. He told me that he knows he could be a famous singer if he got the chance. It meant the world to him when I told him how well he sung. Estela came up to me and started singing the song, “Alabaré” which I knew and we sang it together. She is almost 90 years old and was just moved to this old age home in Santiago, Chile when the home where she was collapsed in a storm and she barely survived. She began to cry as she told me she had always wanted to travel, especially to Italy but now it was too late. She told me she has kids but they never come to see her. Caesar is in a wheel chair but holds on to the dream that he will walk again. He lost the use of his legs while fighting against the FARC in the jungles of Colombia and to this day has enemies that seek him. It is a long story but we came to know him really well over the years and help him out. The wheel chair he had when we met him was in poor shape and we were able to find a guy who made wheelchairs and who was also in a wheel chair himself. The two became friends and were able to help each other. Caesar lives up a steep mountain and will fly down the road in his chair and has crashed at times but he is trying to keep a job and can’t be late. I met a young man in a wheel chair, paralyzed from being stabbed in the back and robbed. His best friends are his dog and his kitten, his name is Jason. I met a young African American man down town New York City who lost the use of his legs due to diabetes and then the loss of his job soon followed. He sat in a wheel chair with a cardboard sign, respectfully asking the passerby’s for help. I saw him on and off while we stayed in New York. He always greeted me with a smile and called me his angel. She had to be almost 80. She was very clean, jolly and grandmotherly but sat on the street with a cardboard sign begging. The sign explained how one day the power in her house just went off and then a few days later someone told her she had to leave. Her son stopped paying the rent and she had to move out to the street. The women explained to me that when she was younger she would always walk this same street and give clothes to the needy, and now she was in need and no one came by to help her. I know a man named Henry Ford who lives in Panama. He first approached me with a mask over his face. When he lifted it to talk to me he showed me that he has no nose or lips, only an empty hole! He was under a car welding when the burning hot beam fell on him and burned off his face. He is hoping to someday save up enough to pay for surgery, until then he has the mask? In Las Vegas, Nevada there are so many people who have hit hard times. We visited a tent city that is in some back sand lot one day and talked to a lot of families. On the bridges that cross the Strip men and women will beg or try to do little things to make money. Some little thing could happen to any of us and turn into a desperate situation. I met this guy named Daniel in Brazil whose legs were severely deformed. He had made a little cart for himself and had two dogs that pulled it and he steered them around. He had the coolest attitude and it was quite a sight to see. One day as we were descending a steep past in Mexico, we looked off to the side of the highway and saw a man in a black cloak. He was more like a vapor or a phantom, barely alive. We picked him up and took him to a motel where he could bathe (he worse than you could imagine) and gave him some food and clothes. He told us that he was an American that came to Mexico to travel and was robbed. He said he knew he was right near death if we had not found him. His name is Mark and a really hope he is ok somewhere. “Thank you, may the blessed wise Father give you health and luck…” He says this every time someone gives him money or touches his shoulder. He does not answer you if you talk to him and he does not say anything else. He is blind and deaf! He stands on the same corner every day and has learned this one phrase. He lives in Nicaragua but I don’t know his name because he couldn’t hear me ask him. I met a beautiful man named Santiago lives in Argentina. He is older, well refined as most Argentineans but he has to beg. He used to be a baker but lost his leg when a drunk driver hit him. He sits in a wheel chair and calls out all though he told me he is so humiliated to do so. He hopes to some day get a prosthetic leg and continue to bake. I knew a man who lost his eyes because of a vicious crime and then became homeless. I gave him some food and he told me he could not eat it because he had no teeth. I could only give him soups and yogurt. I met a woman in Mexico of seventy with scrapped up knees, carrying a load up a mountain, so heavy a young man would stumble. 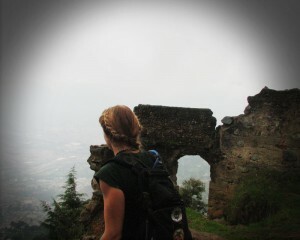 I carried the back pack for her a ways and had to stop and take a break as we climbed the steep mountain. She does this every day. At times I have seen homeless people completely naked, trying to hide from the public. In some cases they were robbed by someone who took the clothes off their backs and they are now completely humiliated. It is a great blessing to clothe them. As we walked down a volcano in Guatemala, we stopped to visit some of the houses on the side. We met a lady whose husband had Alzheimer’s dieses and she weld up as she told us he did not remember her. Her roof is made of junky tin so floods every time the heavy rains fall and rats come down and will fill her house. She opened the door to the cupboard where she kept her food and had two eggs inside it. You know what? She was trying to insist that she serve them to us. Its funny the more people I write about, the more I remember and there are just so many. But what is more important is that there are so many more stories our there that no one knows but need to be written. Will you write them? I have traveled to over forty countries around the world and have seen many things. There is so much good that you could do with your life my friend, to change and touch the lives of so many. There are countless old age homes full of forgotten souls who would give anything to sit and talk with someone. There are countless orphanages all around the world full of sad lost children who feel unwanted and desperately need love. The prisons are full of men and women living with regret and sadness. Some just made a mistake and are now thrown away by society with no one to so much as visit them or bring them a little something. The streets of every large city, in America and in every other country are full of poor, homeless, handicapped and needy people. The war veterans are forgotten. And people with special needs and disabilities need encouragement. These are the invisible people, forgotten of or hidden by society. “15,000 people with hunger” read graffiti on a wall in Colombia. Snack packets we made up. Because we may not be hungry, it’s easy to forget how many people are, both in foreign countries and also in the United States. I have heard some people say that the homeless are homeless because they are just lazy and I am sure in some cases that is the case, but my experience from traveling all around the world is that things can happen to anyone at any time and lead to a bad situation. I have talked to so many people, from New York, Las Vegas to Russia, Africa, and all through Mexico, Central and South America that have the most amazing stories to tell of who they were, and now who they are. Where they were and now where they are. This is a human soul. I am not rich and you may not be either, so I am not talking about giving away a lot of money or donating to some charity. Many times I will go to a bakery, thrift store, grocery or even wal-mart store and explain that I want to help a certain amount of people. I ask if they have anything about to expire or overstocked that perhaps they could give to me or discount and many times this has worked out. Sometimes you can get stuff cheep in bulk and then make up little snack packets. There are many creative ways to care about others that don’t take a lot of money. Sometimes just giving time can be the most important thing. I bet within one square mile of where you live there is someone that you could sincerely care about and help out in someway. Like I said, I am not saying through a charity or organization but rather just you making an effort to turn away from yourself and love another. Maybe you have a negative attitude when you think about prisoners. I understand. You think about the victims they hurt by their crimes and think they deserve to be in prison and are paying the due punishment. For many of them that is true and I have often worked with the orphans, widows and handicapped who are the victims of a crime. I have seen both sides, the criminal and the victim, or you could say, the victim and the victim. There are so many men and women that suffer horrible injustice for one mistake that any of us could have made. It is easy for us to feel self righteous and think we would never do something that would lead to prison but you have to think of times in your own life where you either made, or almost made a serious mistake. Perhaps you had an outburst of anger and wanted to punch a guy, or what if you were so desperate to feed your family that you were driven to steal, or in many cases in foreign countries, carry drugs to make money. Maybe our mistakes never resulted with serious consequences but in another life, they could. One laps in judgment, one time of being in the wrong place at the wrong time and now, your life is destroyed. I have entered numerous prisons around the world to visit, perform for and share the Gospel with the prisoners (see blog 2014). It always takes work, letters, calls, constantly bothering the main office, but of all social groups out there, Jesus talks about the prisoners. I could tell you unbelievable stories of horrible things I have seen inside those walls. So many suffer terrible, inhumane conditions, poor and little food, violence and corruption for crimes like not paying the rent or petty theft. Many are thrown in prison without ever seeing a judge or receiving a sentence and then once they are in they are lost by the system. I think one of the saddest most heart breaking things I have seen is a chained line of men being brought into one of these horrible prisons. The look in their eyes makes you want to cry. Like water being poured from a glass, all hope is leaving their soul as they go from a free man, many very young, to realizing what it is going to take just to survive in this new horrible world. If you are not able to visit the prisoners, but would like to help them in some way, let me know. Maybe you have access to something in bulk, like candy, little blankets (like the tin foil kind), rain ponchos or little gifts like bracelets we work in a lot of prisons as well as old age homes, orphanages and with the poor and would greatly appreciate any help. It is not like some of us are called to an “outreach help the poor” ministry and some are not. The scriptures make it clear, “The righteous care about justice for the poor, but the wicked have no such concern (Prv.29:7)”. The “Prosperity Gospel” is a false Gospel. We are raised in a society that breeds self, ego, and an “it’s all about me” lifestyle. The goal is to get and education, a nice house, then hopefully a nicer one. Buy a new car and keep upgrading, get a good job and get promoted. Jesus says, “He who loves his life loses it… (Jn.12:24/Mt.10:38/Lk.14:26)”. This is what the Gospel is all about. Not nice clothes, social meetings, smiles and good feelings, but loving the unlovable and laying down your life to love others. You can choose to change! It’s like magic, if you get your mind off yourself, and think about others, you forget about your own problems and the little monster under the couch runs away. Step out of your comfort zone and touch those who are invisible and you will realize that you touched an invisible God. You can see your cup half empty, half full, or rather, not see your cup at all and in turn, see the cup in the hand of the man shaking it to get a few coins.